﻿B﻿esan sooji cheela (puda) is a tasty, nutritious colorful breakfast dish served in Northern part of India. Besan cheela looks like a vegetable omelet and it is a perfect alternative for vegetarians and especially for those who want to avoid eating eggs. Besan cheela is also a great dish to break the monotony of typical egg and toast breakfast. Traditionally Besan, sooji cheela is made with besan (chick pea flour) and sooji (cream of wheat) but there are several variations could be made by adding spices and chopped vegetables. The taste of Besan Cheelas is enhanced if you serve it with mango pickle, chutney or aloo tomato sabzi (potato with tomatoes curry). Besan cheelas are very filling they are not only great for breakfast but it is prefect for brunch or afternoon tea time snack. ​ Carom seeds and mix everything together. whisk to make a batter smooth, making sure there are no lumps. Batter should be the consistency of pancake batter or dosa batter. 3. Now add chopped onions, chopped tomatoes, chopped green chilies and chopped coriander leaves to the besan mixture and mix well. Set aside the mixture for at least minutes. is evenly spread in to 6” to 7” circle. upside down and let it cook for 2 minutes. brown, take it off the skillet. 6. Clean the skillet and stir the batter before you start making the next cheela. 7. Serve the cheela hot with coriander chutney or the pickle of your choice. 1. Spread the batter quickly otherwise batter start drying and cannot be spread. 2. 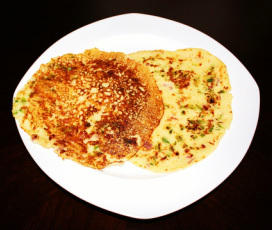 Besan and cream of wheat cheela can be made without adding any vegetables. asafetida and carom seeds (ajwaiin). 3. Cream of wheat absorb water, you may need to add more water while making. could be added in the cheela. 5. If you wish add ½ cup of plain yogurt in cheela batter.